It is seven years since I last ran with a club in Britain. I have been pampered in China, in the sense that there were relatively few people running at anything like my standard, which is that of the average British club runner. I found a group in Nanjing, perhaps hosted by 361º, where there were five regularly faster than me, one of whom was (is) a European. This Sunday morning group usually numbered more than sixty, so think something like a parkrun, but 10km. Separately, I occasionally met undergraduates doing street training, all looking very like whippets and driven by their coaches (harangued, bullied, whatever). I never met any running for themselves. In Qingdao I often met other non-Chinese out running. The hash harriers were aware that I wanted to meet (know of, share race details, etc) runners and one reference gave me a runner better than myself, up to the point when we were close to leaving, by which time I had found three in 18 months around my own standard. Yet in Xi’an I might be club standard, but no-one else was; two extremes, either national standard or club third team. In YangZhou I ran in a large capacity race and was 70th of something like 4000. My standard for the last ten years in Britain was to be at the 96th percentile. It is not good, it just is. Or was. Past tense, because, as I wrote on Facebook recently, returning to Britain brings one down to earth with a bump after such pampering. My uppance came home and laughed. Soundly. I recently joined Wallsend Harriers, fifty years—give or take a week—since I first joined Gosforth Harriers, almost adjacent. Wallsend is a fairly small club after the 600 or so of Tamar Trotters. In Saltash I’d run with the ‘sixes and sevens’, the faster squad, comfortable. In Wallsend, far smaller, I run at the back of the faster group, struggling for air. I have often written of the running aspect of increasing age as approaching a ceiling limit, but really the ceiling is descending. As I have written elsewhere, the gap between comfort and discomfort enough to worry about being at all tomorrow is sufficiently small to make it difficult to race meaningfully. Rather, one trains to work at a pace and tries to minimise changes so as to produce the most efficient result. Putting that another way, whatever the critical factor is—air, strength, stamina—one tries to find the least inefficient use of the resources. But the scope for manoeuvre is small. Part of my problem is that I have, if I am honest, raced very little since 56, or 2009. That year I set a PB at the half marathon and I have rested on these laurels. I’ve run some 800m (2:35 or so, pleased), a 1500m (5:50, awful) and some 10k races [38-42, from good to bad], not noticing until now that the passage of time even across this small window was sending a message I didn’t receive. Or ignored, perhaps. I’ve been talking myself faster than I’ve actually produced. Part of the problem is that same history. In the hash I am known as 2FF, too f***ing fast, and among that sub-species of runner I have comfortably coped with what turns up. So back to Britain, and to club running. Idiot that I am, I haven’t got the message and I’m expecting to run well. The group of guys I run with mostly do just over 1:30 for a half-marathon and I have yet to do one—dare I say it—that slowly. That’s not pride, it’s history, but there’s a prideful fall on the way nevertheless. There were clues enough down on the track (Friday nights, Monkseaton), where I’m struggling to do 90 seconds on any single lap and 6:40 is a good mile, not the immediately repeatable 5:30 I’d have expected twenty-five years ago. Conversely, every interval session shows me producing steady improvement over the evening, but that could just be me harbouring resources smartly, couldn’t it? Going back the next week produces times barely a second different on each repetition. So I’m pushing the envelope but seeing no improvement. A 5km run under race conditions produced 20 minutes, when I should be under 19, in my expectation. 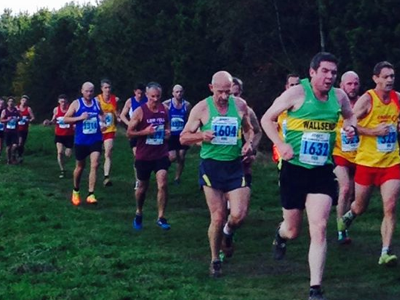 The cross-country season in the north-east includes a league for the local clubs, of which there may be twenty. The races across the season determine club ranking in divisions, much as you might expect. This particular league cleverly handicaps the faster runners by giving them later starts—2.5 and 5.0 minutes after the ‘slows’. Membership of these faster groups depends upon (i) having run well last season and (ii) finishing in the top 10% of a race moves one up a grade immediately. So anyone new (in any sense) goes in the slow group, which is going to be large and stay large. At best, around 25% could be in the other two groups. Within each race the divisions battle for position and, when six runners count for a team, the positions of runners seven to ten can easily affect the total score for other teams. If I’m tenth for my club, but in front of someone else’s sixth runner, that sixth has an inflated score. So three adjacent finishers might well be in different clubs and different divisions. Obviously, the first race of the year is well attended. It was a gorgeous day and the ground was only rarely soft. The route was chosen with an eye not only for ground but for enjoying the spectacle, using a natural amphitheatre very well. Races were sufficiently well organised that one could start before another had finished. A lap of the course was just over two miles and the Men’s race (over 21) was three laps. Which was quite enough, thank you. As a newbie, I’m in the very large slow group and, to my surprise, many of my usual running mates were too. I think four may have been promoted last year (and present that day). The grass is long and we have done more than a mile (top pic at about that moment) before one can see the ground well enough to pick one’s route to advantage. Well, this one's advantage; there’d be some at the front who could see well enough from the gun. I find that lap two is a whole second different from lap one, so I have the pace about right, not that there is much I can do about it. I am struggling for air just as in training and this shows most on anything approximating a hill. On the flat, I hold my own with the field around me and on any sort of downhill I’m appreciably faster. Unfortunately, that doesn’t quite compensate for the dreadful performance on any upslope. On the last lap, I’m balancing what is left in the tank against what is left to run and manage to improve by 30 seconds and maybe twenty places. I get beaten by three on the run-in and there’s absolutely nothing I can do about that—not a feeling I have had before, and not in any way a pleasure to experience. Position, 302nd, I discover a day later on the internet. Of 591 starters and 560 finishers. That is not the 96th percentile, but the 46th. Tenth for the club, which was ninth of the ten clubs in division one and not what we were expecting at all. In terms of self-respect, I did as well as I could—that is what racing is about, optimising resource—but in terms of meeting expectations I have two actions: (i) work a damn sight harder and (ii) change those expectations. I must, I think, do both. Encouraged by other members of the club, I joined NEMAA, the NorthEast masters’ athletics association. ‘Master’ in this sense is an old person, not ex-teacher. Anything from 35 upwards. NEMAA arranges races within races, so that one can compare performance within narrow age-groups, where a five year interval is considered narrow enough. On the internet, there is an excellent masters' site [lollylegs.com] that allows you to compare your performance with world bests and have your score (time, distance, whatever measurement is appropriate) adjusted for age. This gives you two things I think worth remembering; an age-adjusted result (further, faster, heavier) and a percentile position. So a good session in the gym on the treadmill back in China put me (regularly) on the 82% mark. That is, on a good day I would perform at 82% of the equivalent of the best I can expect for my age-group. That fantastic half marathon from 2009 converts to a time of around 70 minutes and 86%. The good ones through my fifties were around the 80% mark—it’s clearly not my best distance by this measure, though what I learn is that my results are pretty consistent. 2:33 for the 800m at 59 converts to 2:03 (about my fastest ever) – and is 82%. My usual 42 minutes for 10km at 60 is really poor though (78%) and the 82% mark would suggest 39:15 a more appropriate result. The 20 minutes for 5km on road in September is just below 81% at 61 and I5 seconds quicker would bring me back to the target 82%. While I thought that run pathetic, lollylegs conversion says the open age equivalent was 16 minutes. Inside 19:45 represents a ‘real’ (age-adjusted) improvement. A world record equivalent would be a real 16 minutes, not that imaginary sixteen that the twenty represented. My best ever was 17, at 19, under the 80% mark for the age I was then. The next 5km road race attempt is Tuesday, tomorrow. I’m relatively not bad and not all that far off the magic 82% that is my measure of doing well. It doesn’t feel like that. It feels as though I’m paying for living in the pollution of Beijing with every hill. Sadly, the information about PM2.5 (see any of the essays on pollution such as #104 if you don’t understand that straight away) is that the body can’t eliminate it, so we’ll see if performance improves and use that to measure any ‘recovery from pollution’. ....and seven seconds. So if I pick one to run early next year, it had better be a good one, hadn’t it? Top picture taken by C at the event described. This is half way through the field and the race. Big field..
My pal Steve who lives in Qingdao and in Seattle lifts weights. His ‘good’ is 91%. My pal Sean of Qingdao and other places in the US is a cyclist par excellence. I think his ‘good’ is more like 95%. If you’re 40-ish and running, look here. If you approach the lollylegs site from cold, you need to look for Training & Nutrition / Technical Info / age grade calculator. Incidentally, world record equivalent at 60 for 100m is 11.7 secs. There’s a guy running locally in the 55-59 bracket at 95%. If you know him, that’s a good previous sentence. Thanks to Mike O’Neill for the pointer to parkruns. There is a run of Hadrian’s Wall in May that I’ve been thinking about, wondering if 70 miles is doable in ten hours rather than 14. The world record is not much over six hours and the fastest woman is only 20 minutes behind. A fast, world-class, ultra-runner is doing 11.4 km/hr [5:16 per km]. Ten hours is amazingly close to the 82% mark, for the oldies fare amazingly well on ultra-distance up to about fifty (years, not miles). I think fourteen hours is far more likely. I don’t think I can do any conscious voluntary activity for that long. Shades of Ten Tors (the 55-mile route each year was pretty close to 100km when actually walked), only a lot faster. Run time that Tuesday was a poor 20:12 in cold windy conditions (so what?). Add 30 seconds to scale up for it being a short 5000 and that is 78%. The previous 20:03 is not much different. The 82% target for that course will be a shade inside 19:30. I did say it had to be a good run, not just a run. 78% is okay, 82% is a good day. But please read essay 188 to see what happened next.